ABOVE: A vintage Djurgårdslinien tram passes the Gröna Lund amusement park. INSET BELOW: Major bus stops have electronic signs that tell how many minutes you'll need to wait until the next bus. SL, the city's transit system, has buses that cover the city and county of Stockholm. In the early hours of the morning when the T-Bana or subway isn't running, night buses fill in for the sleeping trains. For more information on SL tickets and passes, see the Stockholm Public Transport Web site and consider buying a Stockholm Card. Important: You can't buy tickets on the buses, so be sure to stock up ahead of time. Much of Stockholm's tram network became obsolete when theT-Bana was expanded in the 1940s and 1950s, and it was largely shut down when Sweden switched from driving on the left side of the road to the right side in 1967. 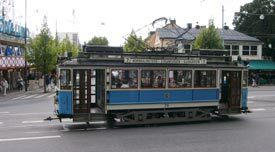 Today, vintage trams operate on the #7N Djurgårdslinien, which is convenient for travel from the city center to the Vasa Museum, Skansen, and other attractions on Djurgården. The trams run daily in the summer and on weekends or holidays in the off-season. A handful of other tram and light-rail routes serve outlying areas.